With an aim to make the cumbersome return filing process under GST simpler, the drafts of new forms put in public domain proposes some radical changes. The forms, which have been released for stakeholder consultation comes after the GST Council in its 28th meeting held on July 21, 2018 approved the new return formats and associated changes in law. 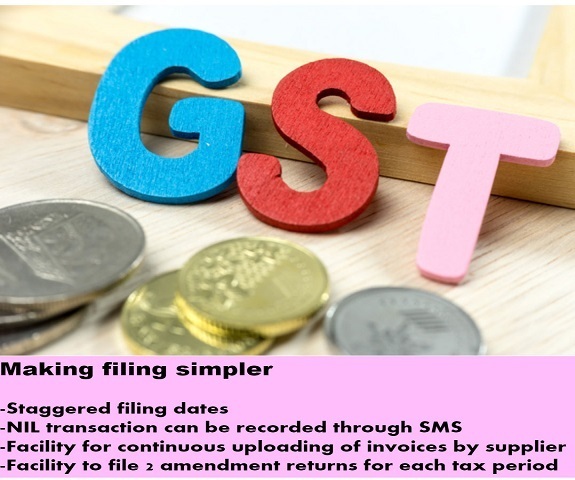 The forms, which will replace the current GSTR-3B and GSTR-1, are expected to be launched by January 1, 2019. The new return forms itself is expected to allow taxpayers make amendments till September 2019.
a. Staggered filing dates based on turnover of taxpayer vis-a-vis 20th of next month by a large taxpayer . b. One Nil return for the entire quarter where taxpayers have no purchases, no output tax liability and no ITC, and in such case, in month one and two of quarter, such taxpayer can report NIL transaction by sending SMS . Singh adds that allowing dealers to file two amendment returns thereby allowing them to report missing invoices and the facility to amend other details pertaining to input tax credit, would go a long way in reducing the reconciliation efforts of dealers. d. Continuous uploading of invoices in normal course.